A while back, Amazon fired all their California affiliates over a tax situation. That was the first time I'd ever been fired, and needless to say, I was devastated and wondered for months what I'd done wrong. If you want to buy something from Amazon, search here to find the item. Once you go to Amazon anything you put in your cart will give me a very teensy tiny affiliate fee. It is not much but it was nice to have that in my account for a book or birthday gift. And, you'll notice my impeccable timing, starting this right after Father's Day. Here is what else I'm worrying about thinking. My last day at work is June 28 and then I'll have to ask my husband for money. He'll hand it over too but being that he's a tightwad conservative and I'm a spendthrift shoeaholic fun-loving grocery shopper, I hate to ask him all the time. All I have left (sob) is this blog. Because you are my beloved readers, I have some ideas and want your option. 1. Blog Talk Radio. Want to talk to me about cancer? About chemo, or treatment? I am registering an account and thought I'd have a little talk radio show about pink culture, cancer, problems and solutions...what do you think? Would you participate? Since it's free I think it might be at 2:00 a.m. but who knows? This won't make me any money but might be fun. Unless I stutter through it. Which, is quite likely. But, if nobody will talk to me than there is no point. 2. eBook. I thought I would write and sell (for a nominal fee) an ebook with tips and tricks I've learned in my almost four years of dealing with cancer. Considering I started Stage II and ended up Stage IV, I have a lot of information that could be condensed that might help somebody. Would you buy it? Would you give it as a gift? What would you want to see in it? What format would you read it in? 3. Swag. If I sold some "But Doctor, I hate pink" items, would you buy any? I know what I have used since getting cancer and thought it might help the newly diagnosed cut some corners if I sold some of the things I found helpful. And, for some of the items I am considering, you don't need to be newly diagnosed either. My goal for the future is to keep me busy, make some money and, most importantly, not annoy my readership too much. I promise not to get so bored I post every hour, about what I ate and what my cat is doing. But, maybe it is time I turned this into a way to make some money, yeah? Can people really do that? I kind of don't think so but maybe I should try, since, I have nothing else to do. This blog is still the story of my life, which sadly, has never been about money. I would totally buy your book and any swag. You rock! Anything to help you make a few bucks. I totally understand the need to have a new outfit every now and then (or every month). Lots of men just don't get it. You sell it, I'll buy it! I think that all three options (along with the amazon search engine) are great options. I would most definitely love the"I hate pink" paraphernalia idea, and think that an eBook, or a book-book would be right up your alley. I also think that the IHP paraphernalia should include post-mastectomy pillows, and you could design nice head-scarves. You also could think about some "books on tape" funny stories for people to listen to when they are having their MRIs/PET scans, etc. I see a whole new world opening up for you Ann. Book and Swag for sure! I would love the idea of an e-book. Most of the cancer books I've read are (1) funny (2) or inspirational, but not particularly useful or informative. Please DO IT! Also, the swag---love the idea because I really do hate pink. And the radio show-all good ideas. Go on Social Security Disability. You're qualified. Keep writing, for sure. You're a treasure. another vote for all of the above, plus - you HAVE to get on Social Security disability. You have certainly earned it, and you qualify. Go for it! Ann, I am a sure thing. I would purchase anything you came up with due to your great talent and fashion sense. Stephanie, All the way over on the East Coast, in Maryland. Oh, definitely! In fact, I just published my eBook (shameless self-promotion here) The Little Pink eBook of (mostly) Cancer Cartoons for 99 cents through Amazon, so if readers find it through your search box, you'd get a cut, which would be great! I would by your book in a heartbeat, and would also buy swag! Would love to listen to the talk show. All your ideas are great and you are so funny and always cut right into the heart of the issues. We need you! Ann, Get some legal advice before you rock on to the radio - i.e., ppl take your advice and well, you know in this litigious (sp?) world we live in. I think your blog is quite nice. I am in THANK GOD now 7 years of remission - are we really ever healed?? So not sure I would have much to say but I'd like to listen in. I had seen this post called how to make money on your blog and I have copied it here for you. Are you on or awars of things loke Blogher? I have not pinged around your blog mush so apologize if you are and I missed it. My point being (and it's not on the top of my head... ar ar!) that there are ppl making money blogging and they are sharing how they have done it. For what it's worth might google that and see what you get? Anywho, I hope you keep us posted as you go. I am single but I do know what you mean about having to ask for $$, when I was married eons ago, I HATED being questioned about what I'd spent and whay when we were equal breadwinners... such is the life of us independent women, eh! Love and God's continued blessings. Ann, Count me in for talking (that I can do!) and buying some swag. I usually only read ebooks so that works too. I have one of the small post-m pillows and use it every night. I'd love to have another (that's not pink). Wish I'd known about the Amazon button. I spend a fortune there. Will start using it. I'm not sure this is going to work, but I'm testing the waters. We need some advice for an entire softball team in crisis. One of our Mom's was just diagnosed with stage iv breast cancer one month after finishing year long treatment. We are all devastated. Our team won the championship two years in a row, so we are a tight group of parents. BTW my husband is a headmaster and i love your descriptions of school life. my only role is the "headmaster's wife" and i love your image of the bird on the lawn with kids freaking out. Today we had a snake on campus. We even live at school!!! @baylorette, what can I do to help you? I can tell you what helped me when I was sick after my diagnosis - food. A wonderful woman took charge and she made arrangements for people to bring me food every few days. I was not able to cook at that time and having those meals for my family were wonderful. Your softball team can do something like that. She may feel fine for a while, but she'll likely start chemo and in a couple of months, she's going to be tired. So, gifts of food are always welcome. Don't ask her, just start doing it. You might show her my blog - as I was diagnosed Stage IV after a year of treatment too. She might find some hope in the fact that I am still alive and doing well. The rest of you guys are awesome. I don't think I could get through this cancer thing without the support of my readers. Who knew when I started this blog it would turn into something that helps me this way? It's nice to know that some of you want swag too. I only have a short period of time until I stop working and then I will be concentrating on this blog more. But, I am not going to make it messy with sales pitches, that isn't nice. :) I promised to write it until the end which I hope is years away. I think they're all great ideas! Do it! 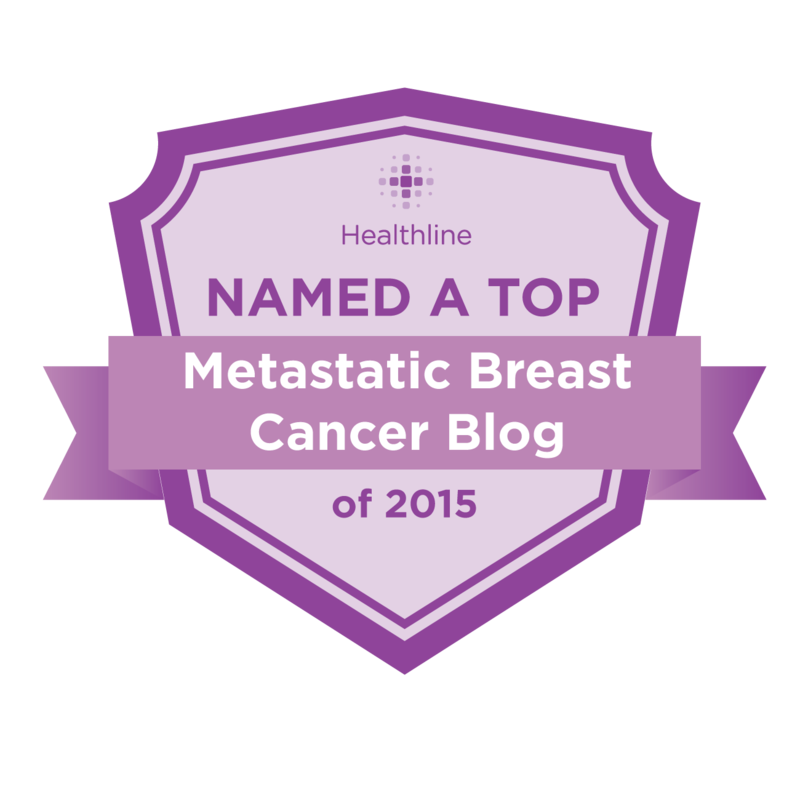 I think there's a great need for first-hand accounts of the metastatic experience. I'd vote for No. 2--and I'd buy it too! Ann, I used your link to order water for a friend in chemo. Are you does that earn you an affiliate fee too? Has Rodizio's made it to Sacramento? We should plan another lunch. Would definitely buy swag and eBook! Fab idea. Swag (Cafe Press!) - yes! eBook - yes! Swag -- definitely! A "But Doctor.." mug! A pink v-neck ladies tee shirt (with your logo) in XL or XXL (I still don't like to wear tighter shirts yet.) But the ebook I'd really like to read is "Secrets of a Principal's Secretary"! I always kind of wondered what kind of person it took to be a Principal's Secretary and what one did. Do you know how mysterious Principal's Secretaries are to us ... non-Principal Secretaries (like students, parents, teachers, administrators, etc.)? I'll just bet you have a zillion funny stories on par with Stephanie Pearl-McPhee (aka Yarn Harlot). And a special chapter of what happens to a Principal's Secretary when she gets slammed with breast cancer and how it affects family, friends, students, etc. and perceptions and... just a lot of things it would be cool to know. :) Whatcha think? I love that you are dreaming of what to do next and think you have some great ideas... go for the fence with 'em! !